This game features two of the most exciting chess players in Black history… Maurice Ashley and Emory Tate. At this point (1993), they were both rising stars with many scalps to their credit. In this game, we can see that both have a sound understanding of tactics and an indomitable fighting spirit. Maurice is a solid all-round player with an expansive knowledge of openings and a deep understanding of subtle positional nuances. He tends to be objective and is very patient with accepting suggestions in post-game analysis. Emory tends to take greater risks while improvising over the board and will often opt for the sharpest line in most cases. Of course, he has destroyed many GMs with his style, but he's sometimes careless against weaker players. 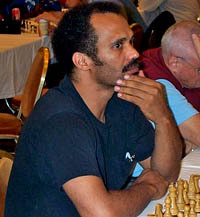 Many know Emory from his slashing victories, but what is often overlooked is that he is a very strong endgame player. 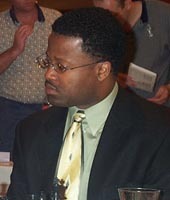 To see GM Ashley or FM Tate engage in post-game analysis is quite a treat to any chess spectator. I wish I were in New York for this one! Enjoy! See Emory Tate - Maurice Ashley, New York Open 1993.